If you take the time to read this article, please note that I do not think that knife collecting should be excessively influenced by making profits. I feel that it is a small factor that should play a small role in determining the direction that we take with our collecting. This article is meant to help make collecting even more fun by ensuring that the hobby is not a money losing proposition. There are several ways to ensure that your knife collecting experience builds wealth. The best thing you can do is make yourself aware of the factors that cause knives to increase and decrease in value, and then use that knowledge to assist you in purchasing your knives. Below are the major factors that I often consider when buying factory manufactured knives for profit. The fundamental trend is that the demand for older collectable knives in good condition is increasing and the supply is declining. Demand is growing because of the increasing number of knife collectors, and the supply is declining because many collectors fail to take good care of their knives. This most often occurs from improper storage and neglect that results in rust damage. As this occurs, knives that are cared for and remain mint become more valuable because there are less of them. This overall trend bodes well for knife collectors who pay attention to their knives. The appreciation of newer knives is generally much slower than older ones. Manufacturers are more than able to meet the demand for new knives by making as many as necessary to satisfy the market. In addition, there is not much of a difference between a knife made in 2001 and one made in 2005. There has not been enough time for the knives to be used or neglected to decrease the supply, and the manufacturing processes and materials used are very similar. Collectors can easily buy a brand new knife at retail price that is essentially identical to one manufactured a few years earlier. Because of this, the price of the knife that is a few years older that was purchased at retail will not bring much more than the retail cost of a new one. This is not to say that new knives should not be part of your collection. There are some nice looking knives out there that are being manufactured, and today’s new knives are tomorrow’s old knives. Take care of them; eventually they will yield nice returns (As long as you stick with quality!!!). Trends have a large influence on the demand for knives. Throughout time, handle material and knife patterns have been in and out of popularity. When a certain pattern or handle material is “hot”, the demand grows, and the price increases. Always keep in mind that knives that are most popular right now may not have been in the past, and may not be in the future. Evidence of this can be seen in recent history. In the 70’s for instance, folding hunters, whittlers, and barlows were hot. They often commanded premium prices over other patterns. More recently, it seems as if congresses, muskrats, and trappers bring more money. Do yourself a favor and don’t go chasing what is “hot”. Keep in mind, however, that certain patterns, brands, and handle materials always have, and will continue to command premiums over others. Don’t refrain from buying a specific knife simply because it is popular and commands a premium. Also, don’t buy a knife because it is unpopular and sells cheaper than others. Unpopular knives often remain unpopular. It is best to collect what you like, and stay a bit diversified. Some will tell you to collect only certain patterns or a certain handle material. This may lead to problems if what you are collecting goes out of favour for some reason. It is generally safe to collect a specific brand because most have long established history that make them more collectable than others. Case, Remington and other well established brands will always be more valuable and will generally outperform in terms of increased value. From the beginning of time, it has been high quality collectables that have seen the greatest increase in demand and gone up most in value. This writer believes It is wise to buy knives that are made of the best materials, and are among the most well constructed. Accept nothing less. High quality will cost you more, but it is important if you want to see your collection appreciate in value. $5.00 Chinese knives from the gas station & “buy 100 knives for $99″ deals do not stand a chance compared to well constructed US, German, Japanese & possibly even some of the more recent higher quality stuff coming from China (Jury is still out on those, but time will tell). 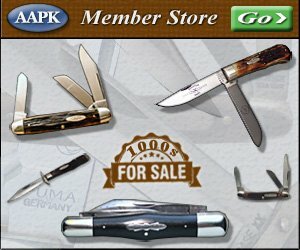 If you are buying older knives, make certain that they are in good shape. Those in the best shape and kept that way will always appreciate more in value than those with flaws. Keep in mind that some older knives are rarely found in mint condition. You can lower your standards a bit (condition wise) for well aged knives.